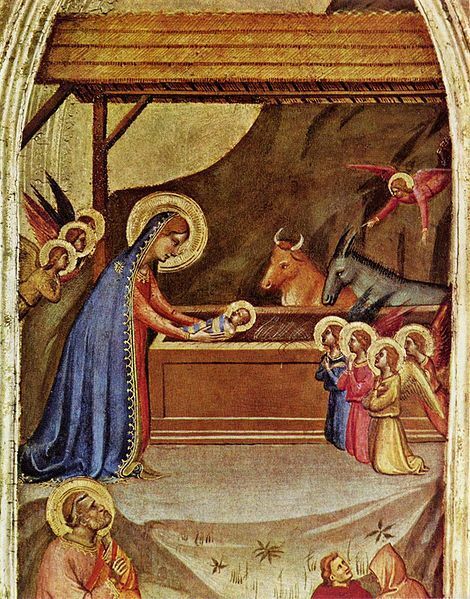 Oil on wood painting depicting the Nativity by the Italian Renaissance artist Bernardo Daddi (d. 1348). Daddi’s works often depict Biblical events and this one is no exception. The Nativity depicts the Virgin Mary placing newborn Jesus in the manger as she is surrounded by angels and a donkey and ox. This famous painting would make a wonderful image to use on a contemporary Christmas card. If you are looking for other public domain paintings and illustrations, please check out our sister site Reusable Art and our free Christmas images and Nativity paintings, drawings and illustrations.